Wisconsin death metal veterans Jungle Rot are back with their ninth full-length album, a self-titled effort. Vocalist/guitarist Dave Matrise fills us in on the album, the guest appearance from Destruction’s Schmier, his other job as a hunting teacher and more. 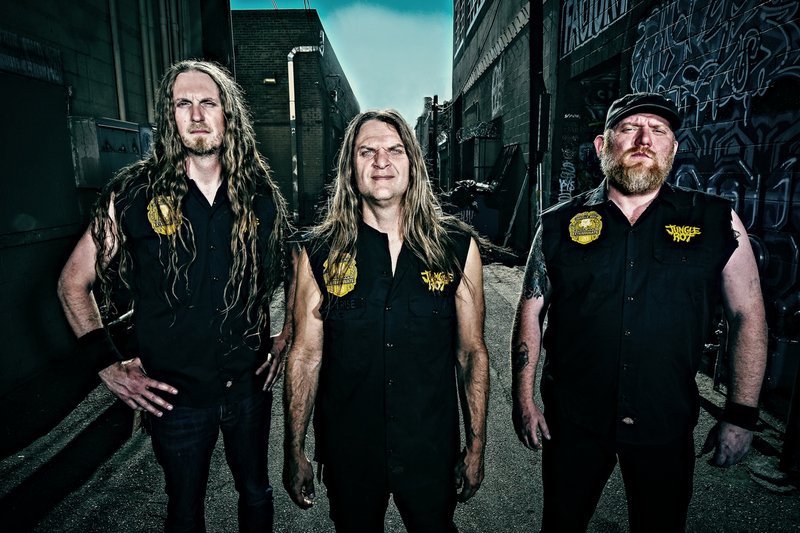 Chad Bowar: Was there anything unique about the songwriting process for Jungle Rot? Dave Matrise: No, I don’t think so, We have been using the same formula that has been working well for us in the past. I write most of the songs on my own, then when I’m ready the next step is that I call Geoff (Bubb, guitars) in for his take. We start by arranging and putting all the vocal patterns and structures together. Then when we have everything the way we like it, and the vocal patterns are so I can sing and play them, we then send the songs to James (Genenz, bass) to write the lyrics. Over the years everyone has found their job to do and what their place is when we write new music. What led to drummer Jesse Beahler’s return for this album? We have always been in touch with each other back and forth on how each other’s careers have been going in music. He had some down time in between his other projects and the timing was right for him to come on out. We have a lot of history together and I feel I made some of my best recordings with him. I knew we had something really good this time around with the new songs so we wanted the best to be on it. I knew I could count on him to deliver, and that’s just what he did, making it another Jungle Rot classic. Who will be your touring drummer? We really didn’t discuss any touring plans with Jesse, but maybe down the road it could happen. I have been working with a young guy named Spencer Austin, he is doing the job well. He reminds me a lot of Jesse’s style and he can pull everything off live just like the recording and we like that a lot. What led you to work with producer Chris Djuricic again on this album? We have done every Jungle Rot album with Chris. He is like a fifth member of the band. He is very talented and knows exactly what I’m looking for when recording. He keeps us all on track with who we are as a band. He is always pushing for the best out all of us on our tracks and we also like the living quarters that he has for us to stay in to keep the band together during the recording process. Hmm being able to reach double digits. This is my tenth CD released and I still can’t believe it. Looking back I never thought I’d see it go on for almost 25 years. Amazing! All thanks to all our fans’ support, old and new, over the years, and Victory Records staying behind us. How did Schmier’s guest appearance come about, and what did it add to the album? We did a cover of the thrash classic song “Invincible Force” some time ago. Schmier always said it was the best cover song he ever heard done of his band by anyone. Years later we had the chance to tour together and as the tour went on he started to call me up on stage to sing guest vocals while they played the song live. After doing it night after night together we could tell we had a good thing going with our voices. I was writing the album at the same time and I knew I had to have him be a part of it. I contacted him after the tour and told him I have the perfect thrash song I wrote for him and would love him to hear it and be a part of it with guest vocals. He said yes and was honored to be a part of it. I think having him do the song with me helped set the tone and direction for the album. It was a big boost helping me to keep writing good songs for the whole album. How did you pick Kreator’s “Terrible Certainty” to cover, and how did you approach the arrangement? After having Schmier do a guest spot on the album it only seemed right to do another classic song I grew up on. This is a song I always wanted to cover some time in my career. The timing was right to do it, so we went for it. When approaching the song it was tough at first but we broke it all down and wrote a click track to play to when we where ready to record it. Now everyone was able to play their tracks to it nice and clean when they were in the studio. Playing to the click made that much better and tight as hell in the end. How did you decide to have Dan Swano mix and master the album, and were you happy with the results? We knew we needed to try something different this time around. Chris (Djuricic) and I usually handle all the mixes and mastering on the past recordings, and they where starting to sound all the same. I wanted to get a fresh pair of ears on it this time around. I have always been a fan of Dan’s work and he was the first guy to come to mind before we started recording. I could not be any happier with the end results. It’s just what we were looking for. It has a very hot and punchy sound plus you can understand everything going on in the songs. It’s one of those mixes that gets better and better each time you play it. You’ll find yourself playing it louder and louder as well. What inspired your lyrics for this one? Most of the lyrics come from everyday occurrences with life in general. Some are about the government, some are about our best friend getting murdered, some are about retaliation. Mostly going through the struggles of life. How do you go about setting goals and expectations for albums? Our goals are always the same as all our albums: to write a better album then our last one, to steal as many souls when listening to it, and to gain new fans. So so. I pay more attention to the zines than the online reviews. It cuts out all the negative comments. Will be doing a run in July with Havok and a few one off shows after, including Heavy Montreal Festival. We are also working on plans for Europe and North America for next spring 2019. How come you guys don’t tour in the fall and winter? It’s a hard time for me to tour in that time period due to my other job. We also don’t like touring in the winter because it’s just to damn scary with the winter months. You have the snow, the ice, and the cold. It really makes it hard to enjoy yourself out there the way we do it. We do everything ourselves, all the driving, we sleep in the van and so on. So the cold is a no go for us. What led you to become a hunting teacher? I been hunting all my life. My uncle use to take me every weekend before I could carry a gun. I would just walk the fields and work the dogs with him while he got his game. I knew I was good at it so I wanted to pursue it. I found a private gun club in my area where I live and started working there. I’ve been there now for over 30 years. It’s a beautiful thing I have, wanting to get up to go to work everyday and teaching the next generation to hunt. It seems like death metal is on the upswing, with classic bands releasing great new albums and a lot of excellent younger bands. Do you agree? Yes it is. I’ve been waiting for it to turn back around and it has started. All the greats are coming back now with new music and doing select dates and festival appearances here and there. I like the younger bands as well. New up and coming bands like Skeletal Remains, I can’t get enough of them. I like Necrot as well. There’s something about a three piece band that reminds me of Sodom. What was your reaction to the recent passing of Vinnie Paul? Sad and scary. We had the chance to tour with HellYeah in 2015. Vinnie was the coolest guy ever. He would have huge barbecues every other night and feed everyone the whole time. He loved to cook and make people happy. We really lost a good person that cared about everyone. Thanks everyone for taking the time to read this. Don’t forget go and buy our new self-titled album Jungle Rot out July 20th on Victory Records. You will not be disappointed!